such bounty has been born of earth! and keeper of hidden oaths. A massive search is ongoing off the eastern seaboard of the United States for two teen boys, experienced boaters, who have been lost at sea. Drownings tend to affect me in a deep place, which is why one of the unpublished hymns in Depth of Praise was inspired by the massive loss of migrants in the Mediterranean as people try to escape wars and other troubles and make for Europe. Not knowing the fate of loved ones is also something that speaks to me; I would not wish that pain upon anyone, no matter the species of, relationship to, or circumstances surrounding the loss. Together, these experiences inspired me to dedicate a prayer to these boys. May they find peace, in the arms of their families or arms of the gods. I will make offerings in favor of their fates being known sooner, rather than later. For about as long as I have been studying Hellenismos, I have been intermittently attending Quaker meeting. I am not, at this time, a Quaker Pagan, but I do find that the Quaker way can deepen my understanding of my gods, which strengthens my worship. Today, I witnessed a very powerful message. The meeting I attend is unprogrammed, which means that the congregation sits in silent worship, unless someone is moved to provide vocal ministry, at which point they would rise and speak the message in her heart. Vocal ministry is not common in this meeting, or so I’ve been told — it’s the only one I’ve ever attended. Two or three people may speak, or perhaps none at all until someone at last turns to his neighbor and says, “Welcome, friend,” and offering his hand to shake, signalling the end of worship. Below the meeting room is the First Day school, attended by a varying number of children, ranging from the rowdy and precocious to the tirelessly rambunctious. Bits of song and play waft up through the floor, from time to time. But today, children were unbound. There was a particularly large group, and it was a rather fine day, so they went outside to play. The meeting house is a converted residence, the meeting room taking up much of the main floor, with the front doors leading into it directly and the another exit from the room directly opposite. The front door is generally open on warm days, and a towheaded toddler wandered near, but not into, the meeting room. Soon thereafter, the back door to the meeting room quietly opened, and the toddler’s slightly older brother let out a screeching whoop! and ran through the middle of the meeting for worship, eyes only on catching his sibling. Vocal ministry bubbled up after that. One man spoke of the “little divine messenger” who brought a message that it’s time to wake up. A woman later rose to say that she likened the pass-through to a speed boat zipping over the water, disrupting all in its path, but leaving no trace as the waters return to calm. Devoted to Poseidon as I am, this last took my notice. Attending meeting makes me particularly sensitive to messages: the environment is conducive to them, like it is in dreams. This seemed like a very clear message, and what’s more, it was received by everyone. I don’t think each person heard it the same way, but I doubt each of us needed to hear it the same way, either. Some very devout Christians got as much out of the message as I did, and from how the conversation went afterwards, it was a message heard ’round the room. Just a few short weeks ago a friend of mine took a tumble, and the impact of her head striking the ice outside of her home resonated deep within my soul. We talk about the cycles of the world, and how similar things tend to happen again and again . . . this felt like one of those, and for a short time I was taken back a few years to when my father had a similar problem. I learned, or maybe was just reminded, that although there are patterns and cycles in the world, they don’t always end in exactly the same way. For that, I am grateful. So what happened is this: a friend of mine, Carol, stepped out one day, slipped and fell on the ice, hitting her head. She posted on Facebook about it, and how she’d gotten a killer headache. Later her daughter took over, sharing with friends that Carol quickly developed nausea and disorientation and had been rushed to the hospital. She had a subdural hematoma — there was bleeding in her brain causing pressure. Carol had emergency brain surgery, friends and family clustered around her comatose form, and several days later she started to show signs of recovery. She’s lost some beautiful silver braids and gained quite a surgery scar, but she’s now in rehab, rebuilding her strength. From what I’ve learned, most of what she’s recovering from is being still in bed for all those days; swift action by family and hospitals seem to have prevented serious brain damage. From the start I saw parallels to my own family. My father had slipped and fallen when out shopping, and likewise hit his head. I think the bleeding must have been slower, though, because although he had a headache, he didn’t develop other symptoms for several hours. Unlike my friend Carol, my dad was only in the company of my mother, who is severely disabled and unable to get out of bed. Once she realized there was something seriously wrong, she needed him to bring her the phone in order to do anything about it. It took him over half an hour to do that, crawling across their room through his pain and disorientation. It was his last conscious act. In the first few days after Carol’s surgery I didn’t know what to say to her family. They reported she was squeezing their hands sometimes, or trying to speak. Dad had done that, too, but after two weeks the brain surgeon told us he would never recover. Given that I’d had to honor his final wishes at that point, I wasn’t sure if Carol was going to be much better off. I was seeing a cycle repeat itself, and I feared for the worst. My fear for Carol was real, and it was based on my own experience. Rather than visit it upon her, though, I decided that I’m a Pagan, dammit, and I’m going to pray instead. 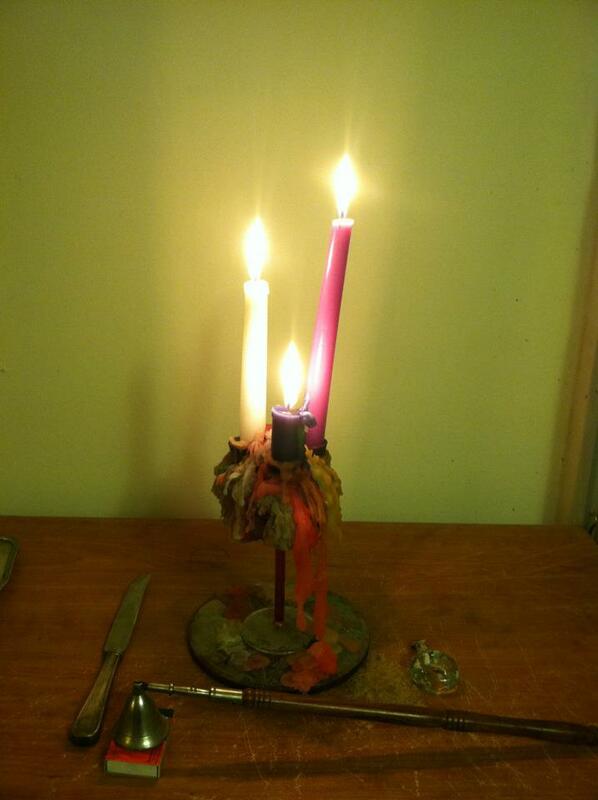 I quite literally dusted off the candelabrum that I had used for years to honor the triple goddess. I’d found this odd, triple-stemmed shot glass at a garage sale, and converted it into a candle holder. The three candles were always at different heights, representing the maiden, mother, and crone. Their interplay caused some incredibly beautiful wax formations to develop, dripping between the stems and onto the carved wooden pentagram I used as its base. After several moves I had stopped using it, and it was dusty as all get-out, and some of the wax had broken off of it. Now that I am practicing Hellenismos, I took the symbolism back further in time, using it to honor the Moirae, the Fates, and ask their intercession. I have never felt comfortable asking for things beyond my ken, so instead of simply asking for Carol’s life to be saved, I asked that her transition (either returning to her life or moving beyond it) be swift and uncomplicated. I didn’t want her and her family to suffer as she lingered between life and death. So now Carol is on the road to recovery, and her fate is not the same as my father’s. I am thankful to be reminded that fate is not immutable. I am also thankful that I have learned more about the Moirae. Their number and gender are the only similarities to the triple goddess of Wiccan belief, and their role is quite different, as well. I’m thrilled that some of my oldest ritual tools are finding their way into my current practice, because I feel like it’s a natural progression of faith rather than an arbitrary shifting of spiritual gears. That’s about it for my ruminations on fate, religion, and prayer. I have to get ready to go to a Quaker meeting now.